The plan also attacks the established role of universities in advancing knowledge for the benefit of society. It expects more research to be funded by private industry, and it urges researchers to commercialize their work. Research funded by industry privileges short-term and applied objectives with immediate economic benefits and spin-offs. Many research questions that are important to society will fall off the table. Since professors draw on their research for teaching, the instrumental nature of industry-funded research will compromise their ability to provide a well-rounded, reflective education that will benefit students over their life-course. Finally, the government’s plan will undermine the diverse, broad-based university system that exists in Quebec. It calls for universities to attract an additional $54 million in private donations each year, and it ties significant public funding to a university’s success in enticing private donors. These changes pit universities against one another in a contest for private funding, and shift resources toward the universities with the wealthiest alumnae and corporate connections. Greater inequalities between universities will downgrade the training and infrastructure available to many Quebec students, translating into broader inequalities in society at large. The competition for private donations will also place greater emphasis on university branding at the expense of broader ideals and investments in the quality of education. The government’s plan to privatize the funding of Quebec universities threatens both the accessibility and the quality of our education system. The broad-based student strike embodies the values of our society by opposing a Liberal agenda to privatize educational funding. As professors, we lament the interruption of classes and wish to resume teaching. For this reason, we call on the Charest government to end the strike by rescinding the plan’s tuition increases and emphasis on private funding. In doing so, we stand for the accessible and public nature of higher education that the people of Quebec have long valued and defended. Professors who wish to add their name in support can use the form below. If you are a student or a member of the general public who wishes to support the professors statement in opposition to the privatization of universities you can sign a petition by clicking the links below. 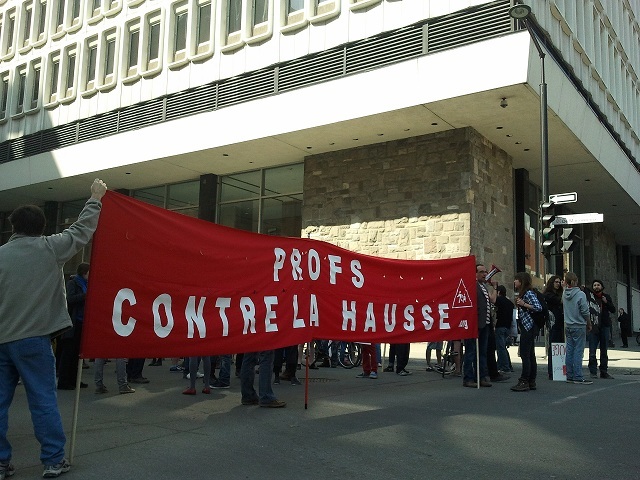 I, Alexandre Enkerli, part-time faculty in the department of Sociology and Anthropology, support this statement and oppose the privatization of universities. In fact, I rarely sign such things and often have issues with petitions. But this one touches me more deeply than most petitions I have seen and I sincerely hope that our voices will be heard. Thanks Alexandre your name has been added to the list. Thank you for your support. Thank you Thomas. We have now added a section to the webpage for McGill faculty that would like to sign on to the letter. Please feel free to let your colleagues at McGill know about the letter and the website as you see fit. Sam, thank you for your support and we have added you to the list of professors in support. Yuriko, your support is greatly appreciated. We have added you to our list of supporters. Very well put! I support your statement completely . Please add my name to your list. David Avis, Full-time faculty, School of Computer Science, McGill University. I support the statement by Concordia’s professors. My own position is that university education should be free. We are happy you are on board. Will add you to the list and thanks for your support. Thanks for the support. We will add you to the growing number in support. Hi Jenny, we are more than happy to add you to the list. Look for updates later on today. I, Freida Abtan, Part-Time Faculty, Design and Computational Art (Faculty of Fine Art), support this statement and oppose the privatization of universities. I Jason Prince part time faculty at the School of Community and Public Affairs (SCPA), Concordia University, support this statement and oppose the privatization of universities. I fully support the strike. I oppose the privatization and the commodification of education. I, Brian Cowan, a full-time professor in the Department of History & Classical Studies, and Canada Research Chair in Early Modern British History at McGill University, support this statement and oppose the privatization of universities in Quebec and around the world. Education should not be privatized. Je supporte entièrement cette lutte importante contre la hausse des frais de scolarité, et je m’oppose de ce fait au tournant que le gouvernement québécois actuel veut imposer aux universités. I, Alison Loader, Part-Time Faculty, Design and Computational Art (Faculty of Fine Art), support this statement and oppose the privatization of universities. Please add my name as well! I, David Macaulay, Librarian at Concordia University, support this statement and oppose the privatization of universities. I, Roberto Viereck Salinas, Full-Time Faculty, Classics, Modern Languages and Linguistics (Faculty of Arts and Science), support this statement and oppose the privatization of universities. Hello Roberto, I will remedy that situation. An updated list will be posted in about an hour. Please correct how my name appears in the petition. My family name is APRIL and my first name is Raymonde. Many thanks !! “I, Martin Racine a professor in the department of Design and Computation Arts support this statement and oppose the privatization of universities”. Could you please correct my name in the list of signatures. It is Alex Guindon, not Guidon. Alex, I so sorry about the error. The list will be updated in the next hour and I will make sure it is corrected. I, Candis Steenbergen, a professor in the department of Women’s Studies, support this statement and oppose the privatization of universities. I also thought that I had signed this already — please add my name in support. “I, Owen Chapman, a professor in the department of Communication Studies, Concordia University, support this statement and oppose the privatization of universities”. I, Goretti Ramírez, a full-time professor in the department of Classics, Modern Languages and Linguistics, support this statement and oppose the privatization of universities. The very sudden increase after a politically motivated tuition freeze together with the plan to shift the decision as to who gets how much money back into the hands of administrators (for the scholarships) or even private industry (for larger university and research funding) amounts to giving up on the plan between generations for a system of quick, short term rewards for currently favoured ideas. Since this move is not accompanied by similar adjustments to other highly subsidized programs, I see no justification for it yet potential for great harm. I do not believe in the privatization of education. i thought i signed this as well, thank you for adding my name.